BFGoodrich All Terrain T/A KO tires are designed not only for tough all-terrain use, but also snow and ice for those who do most of their driving on the highway as well. The tires are equipped with a computer engineered M+S rated tread design that provides for an all-terrain pattern that enhances handling and durability on any road surface, while also maximizing dry and wet pavement traction. A unique “shoulderlock” system incorporates upper sidewall traction bars, which increases the tire’s ability to tract through deeper sand and dirt. Inside the tire are double steel belts along with 3-ply polyester cord sidewall plies, which BFG calls the TriGard system. A stiffer sidewall improves handling and maneuverability. In addition, single strand beads provide maximum strength and create a much better fit to the wheel for greater stability and increased ride quality. Overall, the BFGoodrich All Terrain T/A KO is a solid choice in all-terrain tires. It handles any and all types of terrain, while also providing good highway manners and getting you through snow and ice as well. Perhaps the best thing we could say is that the tire isâ€¦dependable. Prices on the All-Terrain T/A KO tires range from around $150 on 15 inch series tires to approximately $550 on 22 inch series tires. Who Are BFGoodrich All Terrain T/A KO Tires Designed For? BF Goodrich has designed the All Terrain T/A KO tire for drivers of all types of pickup trucks and sports utility vehicles who want to get the most effective tire for all types of terrains and road conditions, regardless of weather and without compromising comfort. 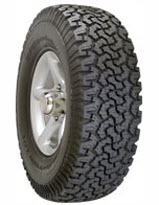 BFGoodrich does not have a mileage warranty on the tread life of the All Terrain T/A KO tire. You will however find a first 25% of wear for the tire uniformity. Materials and workmanship are covered for 6 years and include a free tire replacement during the first year or first 25% of wear. A prorated amount is given for the remaining time period until there is less than 2/32 inch of useable tread depth on the tire.